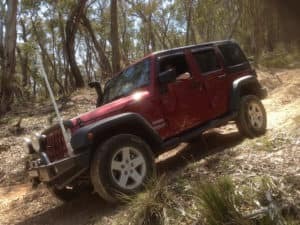 If you like to take your Jeep to the mountains for some fun riding and driving, it is important to have the right tires. Here are some tips on finding the best off-road tires for your vehicle. Make sure you check with the manufacturer and find out the size of tire your Jeep can handle so you don’t push the vehicle beyond its limits, and make sure you buy a size that will clear the fender. An all-terrain tire is a good choice for a driver who spends time both on the road and off road. These types of tires have an interlocking tread that will provide the traction you need in mud, dryer snow, and even on ice. They also give you the traction you’ll need when driving on paved roads. A benefit of an all-terrain tire is that they tend to last a long time. If your drive time in your Jeep is spent mostly off-road, then a mud-terrain tire is a good choice. These have larger lugs and a tread pattern that is more aggressive than what you would need for driving on the road. The tread has larger spaces in between them to help grip better and bite at the loose terrain of those off-road surfaces to help you get through the rough ground. This larger tread also keeps the contact patches from gathering pieces of mud and gravel and accumulating debris so they continue to grip throughout the ride. If you live in the snowy mountains it is a good idea to get off-road snow tires. These types of tires have a design that will stay soft and pliant even when the weather is cold, and the tread has a lot of grooves and channels to help the tire grip into the snow and ice to keep you from slipping. Whether you are driving on the road or off the road, it is a good idea to have a good snow tire when there’s snow or ice around. The height and width of the tire is also something to consider before buying, and what you need depends on the type of terrain you’ll be driving on. A wider tire helps when you drive on sand or mud if your vehicle is on the lighter side, but if it is heavy, a narrow tire might be better so it grips down below the surface. A taller tire is also better in most off-roading situations because they provide more clearance and keep the underside of the vehicle away from the rough ground below you. There are many things to take into consideration before choosing an off-road tire for your Jeep. You also want to keep in mind how steep the area is where you drive. You’ll need better edges on the tires if you drive in the hills and mountains than if you are on flatter grounds that are just muddy.